Today I’d like to talk a little about about mirrors in laser cutter machine and troublesome issue I had with mine. In a laser machine like mine there are three special mirrors that bounce laser beam from the tube where it get’s created to the head/nozzle where beam of coherent light get focused by a special lens into a very small and very hot dot that’s projected on your work-piece. These mirrors are unlike regular mirror in your bathroom. Your bathroom mirror has a layer of glass behind which there’s a layer of very think aluminum (or other reflective material, i.e. silver). Aluminum reflects the light, and glass protects reflective layer from. Unfortunately infrared light (which is what created by CO2 gas laser tube) cannot pass thru glasss most laser mirrors must have reflective layer in front, in most cases not protected by anything. Additionally it’s reflectivity or reflectance must be very high, so most laser beam can be reflect and not absorbed. 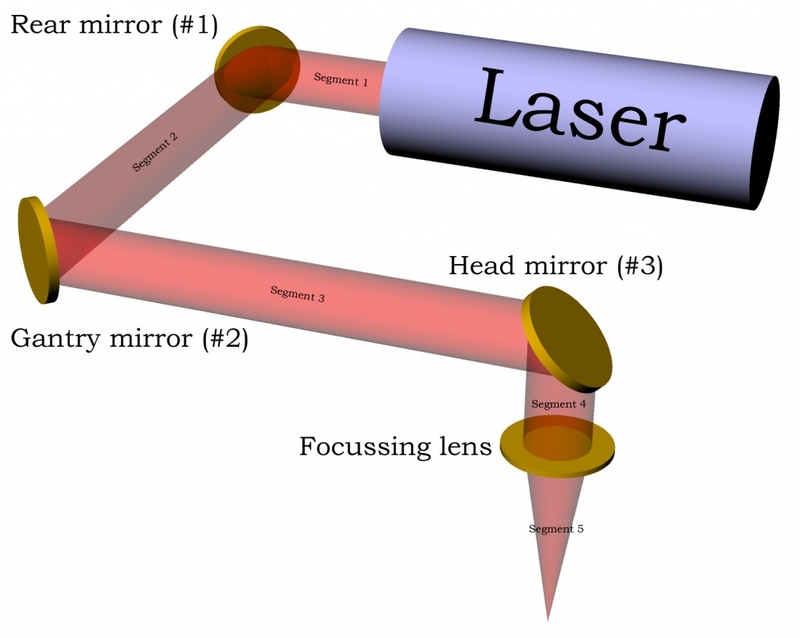 When laser is absorbed it heats up the mirror and can even burn it. When I was looking to get a replacement for my mirrors (more on this later) I had do some research and ask around and this is what I found out. Silicone (Si) with a thing gold layer on top. This mirror is relatively inexpensive and good for lasers up to 80 Watt. It has great reflectance, but hard to clean and can get damaged easily. 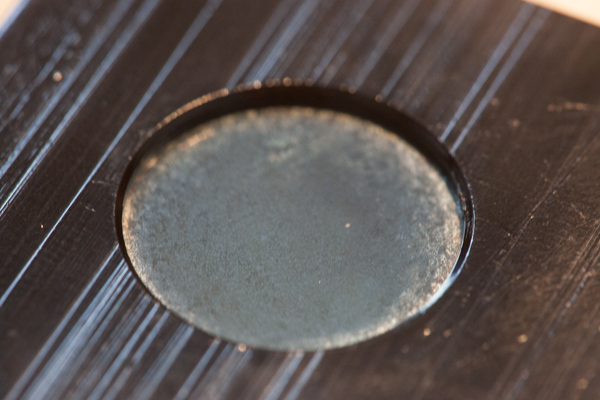 Molybdenum (Mo) polished to a mirror like surface. Very tough material, not easy to scratch and can be used in high powered lasers (over 80 Watt). Unfortunately it has somewhat low reflectance and costs more than Si. Has better reflectance than Mo, but less than Gold plated mirrors. It’s also tought and good for high power lasers. Unfortunately it’s difficult to find and probably expensive. Now let’s talk about what mirrors came with my 50 Watt eBay laser cutter. As I mentioned in my previous posts, I got this machine recently from eBay seller in US (California to be exact). Once I got it in my basement (not an easy task btw), I hooked up water and air tubes and fired it up. Once I verified that pumps are pumping and axis are moving, I had to figure out how to change display’s menu from Chinese to English. Read here all about it. Next step was to check laser beam alignment to ensure that it hits all the mirrors in the middle. I plan to do a write up this procedure soon, but it’s actually pretty simple (although scary for anyone who’s new to laser cutter machines). So when I was preparing for alignment I noticed that all mirrors looked very “dirty”. They were reflective, but I can clearly see grain like in a photo taken at very high ISO setting and some kind of dark spots on them. With a q-tip and Eclipse lens cleaning fluid I’ve attempted to clean them, but was not successful. I still did an alignment (and it was fun to make holes in pieces of paper), but defects on the mirrors really bothered me. I decided to completely remove one of the mirrors for closer inspection. I chose mirror #1 (closest to the laser tube) as it was relatively easy to remove. Whole mirror assembly piece held with 2 machine screws. Once I have whole assembly out, I unscrewed 3 screws that has springs on them (probably didn’t have to do that), then two sides screws that held square metal piece with mirror inside it. 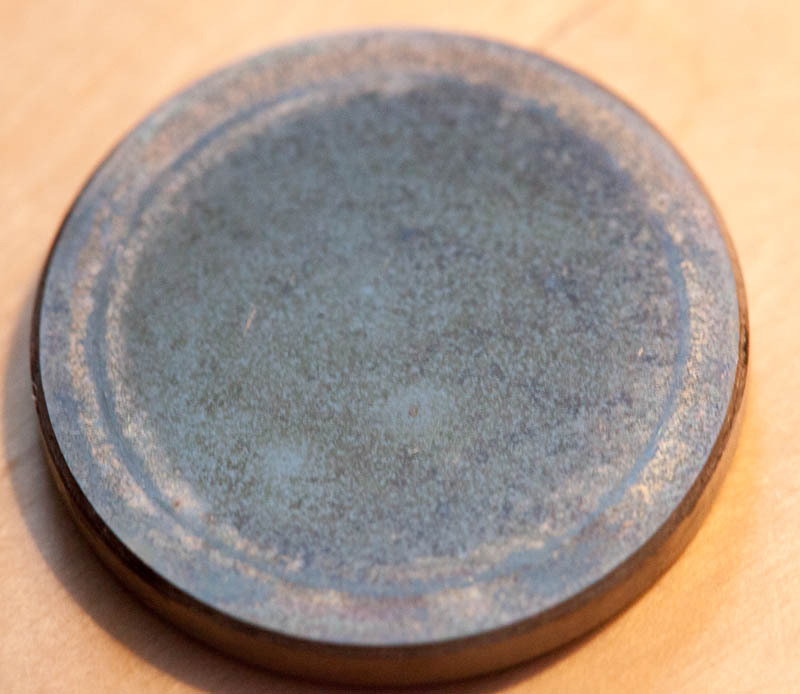 Mirror is held by a round “plug” type screw. I used tool for watch backs to unscrew it and remove mirror. There it was finally, in front of me. A round piece of heavy metal, that looked like it was polished on one side. The “mirror” side looked like it was corroded somehow. Molybdenum has the ability to withstand many non-oxidizing mineral and organic acids. It will corrode in alkalis in the presence of oxidizing materials. The metal is not affected by many molten metals and glasses. 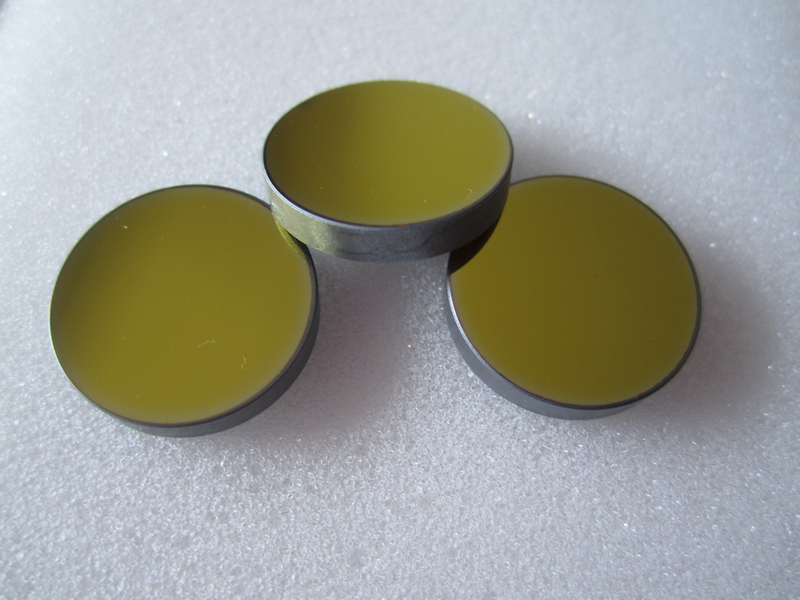 It is resistant to molten lead, gallium, lithium, sodium, potassium and bismuth. Molybdenum begins to oxidize in air at a temperature of 400°C. So I have no clue what these mirrors are made of or why they look like that. If they are regular polished steel, then sure they could’ve get damaged like that considering that machine was watered at some point and then probably stored for a year or longer somewhere in warehouse. While having all these issues with mirrors, I also decided to check condition of the lens. 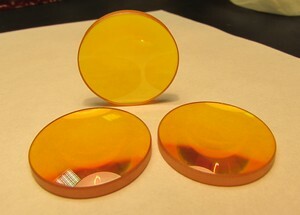 This lens is made out of yellow glass like material called Zinc Selenide (ZnSe). Right away I noticed piece of debris inside the laser head on top of the lens. They look like metal shavings. I decide to remove head and inspect the lens. Once I removed air hose held by a “push to fit” type connector head was easy to unscrew from the assembly. I also removed red laser pointer. 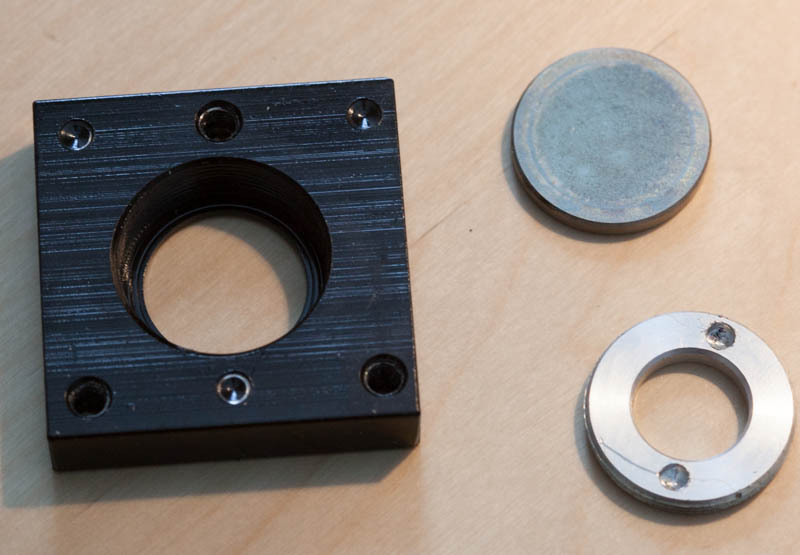 Unfortunately I was not able to get to the lens, as I’m unsure how to disassemble this head nozzle piece. There are no visible threads and it doesn’t turn. But I was able to clean debris with a air blower. Update: I was finally able to get to the lens. With all the issues I described one might think that it was a bed idea to get such machine from eBay. But actually I’m not really upset much, and consider these as minor problems, relatively easy to fix. It’s actually good that mirrors were no good, this gave me opportunity to learn more about how everything works. These are parts that eventually wear out and need to be replaced. Meanwhile I’m finishing up my fume extractor system and custom table that I made. I will do separate write-ups about both of these, hopefully soon. So how did the lens finally come out? Were really reimbursed for the cost of the new mirrors by the eBay seller? I ask because I just ordered the same machine, from the same seller. It’s being shipped tomorrow (happy dance, lol).